I don’t have many words tonight – there are many exciting things happening right now, but I’m not at liberty yet to share them on the internet. Soon, hopefully. I also have a ton of really tasty recipes to share – like my first ever loaf of bread! And a new soba noodle recipe. And more Vietnamese tastiness. 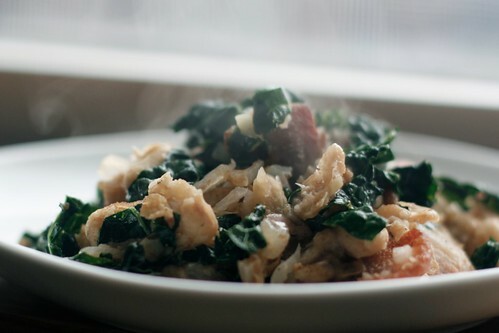 In the meantime, enjoy this great recipe from the ever-reliable Heidi Swanson. I’ve seen many recipes for something similar, but not one has been as good as this. The secret is the creamy and crusty white beans. That, and in my particular case, really good bacon. I bought this great bacon from Whole Paycheck straight from their meat department – no plastic packaging, no nitrates or nitrites, and no preservatives. Just good ‘ol smoked pork belly with some bacon-y spices. I’m convinced that part of the reason these beans turned out so well was that the bacon was of such high quality. Saute the bacon over medium-high heat in a skillet, working in batches. When the bacon is nice and crispy, remove it from the pan and set it aside on a plate lined with paper towel, leaving the bacon fat in the pan. Make sure the beans are very dry, then place them in the bacon fat in a single layer, again working in batches. Let them sit for a minute or two, until the bottom of each bean is golden and crispy, then stir them and flip and let sit for another minute. When both batches are finished, toss in the rest of the beans and bacon. 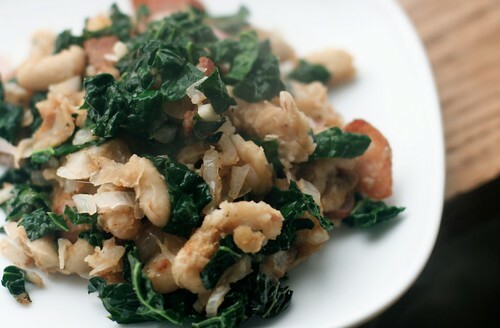 Add the rest of the ingredients – garlic, shallot, and kale. 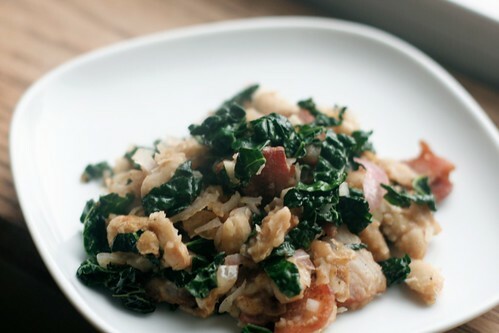 Season with salt and pepper and cook for a few minutes longer to wilt the kale and cook the shallot and garlic. Remove from heat and serve immediately.